This entry was posted on November 30, 2014 at 6:00 pm and is filed under Psychology, religion, Roman History. You can follow any responses to this entry through the RSS 2.0 feed. You can leave a response, or trackback from your own site. Isn’t it fun to weave our own reality. Up until few decades ago, majority of french identified themselves as catholic (as much as 70-80%, even higher, in polling). You cant disclaim that for them. Religion is such a strong force and identity, it drives one’s culture and being daily/life-time. I wouldn’t brush away the influence of Lord Jesus Christ’s influence on western culture for about 2000 years now, give or take. (thats a long time, just thinking 100 years life is long). If french culture influenced catholic religion, or the other way around, is like every-other symbiosis quandary. “All the books and intellectuals fled to Persia.” . I know you are exaggerating, as that is literally impossible. Even now with all the modern transportation and telecom , not everything just moves. If persians were that smart (or if all the books/intellectuals were there) they would have influenced islam for centuries to come, much the same way you claim french influenced western culture for centuries now (which is questionable, to say the least). If I remember well, Patrice said in the past that there was a peace treaty between Constantinople and the Persians protecting Christian intellectuals!!! Given the time, I think there is reasonable evidence for the existence of Cristus (e.g. Tacitus’ Annals). What is interesting is how the anti-Christian acts got started. Rome was very tolerant on religion, although it required religions to be tolerant of others’ religions, and here the Christians failed to perform. The next point came when the great fire broke out, when senators who wanted to get rid of Nero accused Nero of starting it. (According to Tacitus, Nero was in Antium at the time, and he rushed back to Rome and behaved admirably. Not only that, but Nero was as big a loser as anyone.) However, as the accusations built up, Nero needed a scapegoat, so he picked on the Christians, who nobody else liked anyway. I am not sure about Constantine. Certainly, he held the congress at Nicaea, but from what I can understand, that was to put all the troublesome factions into one camp. (Those that refused were, I understand, simply thrown over a large cliff.) Was he a Christian really? I have a coin of his, with the image of Constantine holding a pole, at the top of which is a circle with a cross inside. It looks very religious (and this cross inside a circle can still be seen in churches, etc today) but actually this is the symbol of the soldier’s god Sol Invicta. We may not tell the difference, but I bet the average Roman could. Being baptised on your deathbed is hardly the sign of a devout Christian, nor for that matter, is murdering your family. 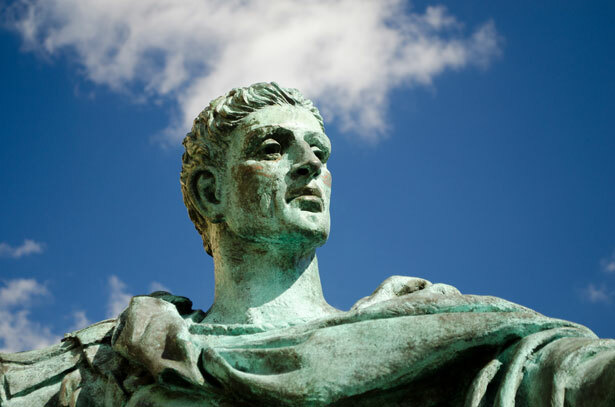 Constantine was a vicious politician and military leader. He did not abhorred any act that could help him to gain absolute power. That’s why he killed his sisters husband, Licinius, and his nephew. Also his Christianity was not because of his piety, but because of political reasons. He has than nothing to prevent the persecution of the Christians by Diocletian the emperor for whom he fought successfully wars. Then since he needed the support of eastern Roman Greeks, among them at that time many were Christians, so he decided to use the cross as a symbol of his army, that put in disadvantage the army of Licinius. After the victory he established one unified church and annihilating the competing ones, including their followers (gnostics etc.) Then he killed his son and wife, probably because of urge of his mother, Holly Helena. I agree and approve this excellent description of Saints Constantine and Helena. The murders of Crispus, his famous and successful Caesar of a son, and Constantine’s second wife is shrouded in mystery to this death. However his son thought Christianity to be a danger for the Empire (and so it was said Gibbon, and history clearly shows). Dear Ian: Christians were not worried during most of the Empire, except for an episode under Nero, and one under Diocletian. There is evidence at least one emperor of the Third Century was a semi-closet Christian. Many top officials were Christians by 300 CE (precipitating the Diocletian Persecution). The circle with the cross inside is thousands of years older, than Christianism. It’s the old Celtic Cross. Americans love to serve great Lords whom they call philanthropes. So Jesus is an All American boy. The US is all about serving. Serve the Lord! “A little historical background is in order. Rome had a state religion, but tolerated other religions. As long as they excluded human sacrifices and allowed soldiers to take the military oath. The latter point brought a conflict between (some) Christians and the state, culminating with Emperor Galerius’ savage repression (3,000 Christians or so were executed, before Galerius, struck by cancer, gave it up)”. This is wrong. Rome never accepted the Christian movement because it was a lefty, anti-imperialist movement. It was after the third century when the right/conservative wing of Christianity held influence and, because of it, sprung a crack between the two wings of Christianity that lasts until today. Jesus was murdered by the radical/orthodox faction of Jerusalem’s Sanhedrin that was allied of Rome and, after his death, many Jewish joined the Christians in fighting the imperialist ideology of the Roman Empire and local allies. The Christians murdered by Rome and local allies all over Europe and Asia were, probably, millions, so Christianity in general and the left wing of Christianity in particular are an essential component in releasing Western culture of imperialism and tyranny. You also forget the cruel persecution against lefty Catholics and liberal Christians by the Protestant forces in Europe. The Templars were free, communitarian people that were exterminated by the French Philip IV, thus causing a severe damage to the lefty wing of Christianity. Although the primary mission of the Order was military, relatively few members were combatants. The others acted in supporting the Christian’s communities in Europe and Asia. Was the French king Philip IV a relevant figure of the present civilization? I doubt it. In short, the progressive influence of politics and economy over the people’s spiritual feelings have formed a big mess provided that such feelings are rooted in the personal sensitivity. Even worse, I’m afraid that hyper-regulation over the spiritual feeling of people will distort the connection with the spiritual realm. “Roman Catholicism” as its name indicate, was the Roman state religion. Repeating blindly propaganda which can be easily proven to be false, is Medieval. Christians killed millions, not conversely. If nothing else, Philippe Le Bel invented the modern police state, and showed the Pope was not beyond the reach of the law. Dear Patrice, you have not mentioned, that Christianity’s popularity was a social response of the slaves, (probably 30% of Roman population) to their inhuman state. The free Roman citizens mainly in the western parts followed the slaves only later. You mentioned not once that the Franks were those who abolished slavery in Europe. I think Christianity has also part in it. When Rom fall apart and was devastated culturally, economically and socially by the barbarians, the Christian monasteries were the institutions that preserved the antic cultural heritage for centuries. When Charlemagne created the Christendom, it leaned his empire on this heritage and saved Europe from Muslim takeover. The uncompromising orthodoxy of the medieval Christians after Charlemagne was a result of continuous invasions of Vikings from the north and the Muslims from the south. So, as rightly Johsh wrote above, you can’t denial the cultural impact of 2000 years of religious practices. Dear Eugen: That Christianity was a response of the slaves sounds good, but I have no evidence Constantine was a slave. Actually Constantine was the son of a general, who became a Caesar, and then an Augustus, a c0-ruler of the Empire, who was esteemed and who died unexpectedly of a disease in his bed. Constantine was a Court kid, and feared, even as a teenager. He became a Caesar as a teen (or close to it), and was even named Augustus by the British legions, upon the death of his dad. There were slaves revolts during the Republic. But not during the fascist Empire. No doubt the 6,000 survivors of Spartacus’ army who danced on crosses for days, left a scarring memory. Also, as conquests were fewer, and everybody poorer among the peasants, slavery lost importance. I mentioned zillions of times that the Franks abolished slavery under the government of queen Bathilde (truly the equivalent of a Roman Augusta). I cannot repeat always the same things: people would get bored. And it’s a drawback of writing essays on the Internet. So Charlemagne led the counter-attack against Islam. But the main work had been done by his father and especially grandfather. Indeed the first Viking attack, a monstrous assault against Frisia by thousands of long boats happened under Charlemagne, in 810 CE. Charlemagne led a massive counter-attack. Christianity was NOT opposed to slavery. Where did you see Zezus irate against slavery? By 400 CE, some of the greatest slave owners were bishops. Some had more than 400 slaves, a considerable number at the time. Christians are lying through their teeth. The real history of religion in the West was far from a Christian (that is Catholic) monopoly. @gmax They may have got baptised on their deathbeds, but that hardly makes them followers of Christ, or at least what is documented about his teachings. We have hundreds of interlocked references to all famous Romans . Plus countless statues made when he was alive, his house, his trophy, etc. The evidence with Jesus: he was fabricated. Saint Paul, first reference on Jesus says this for all to see: Jesus appeared in his head!